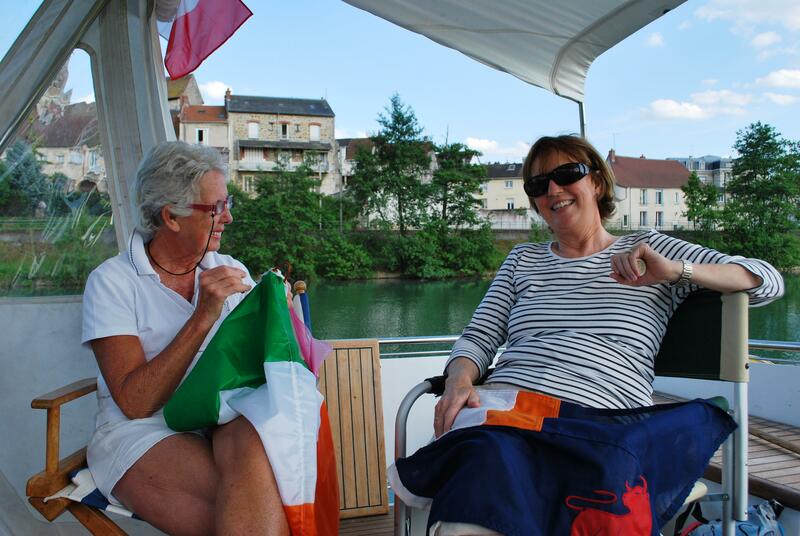 This week we travelled along the Marne River and Nuala’s mother, Aine and sister, Kate came to stay with us. They brought fantastic weather with them, the hottest we have had so far! We really enjoyed this section of the journey. They came because it was Nuala’s birthday this week. The Marne River, while wide and deep has virtually no commercial traffic or pleasure boats. In the last week, we have met a total of 3 barges and 4 pleasure boats ! This makes a welcomed change. No more waiting at locks to let the barges go through first and no more careful manoeuvring around large fully laden barges going somewhere in a hurry. So it made for a very relaxing change after the Seine and Paris. As the traffic levels are so low, the locks are automated. Therefore, by twisting a handle hung out over the water in front of locks, you open and closed them yourself. 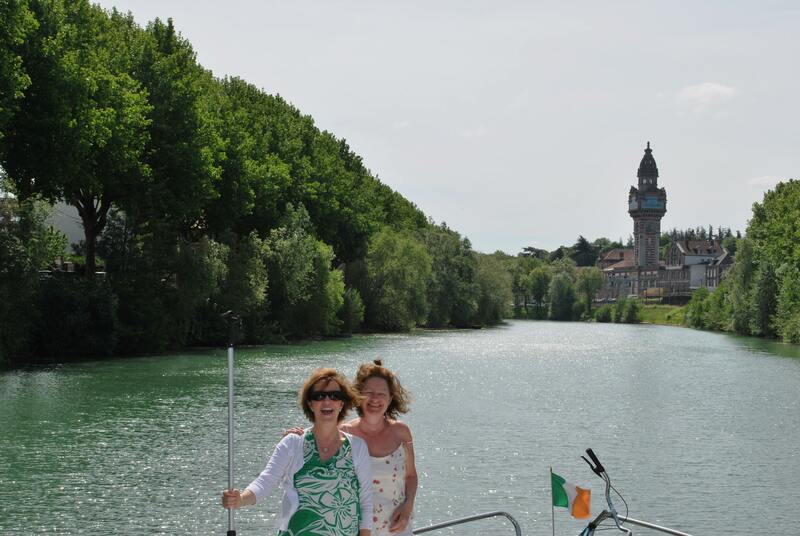 The Marne is a beautiful, meandering river, with as many shades of green as Ireland has. It has lots of wild life (huge fish in the water) and plenty of small quaint towns. We have also crossed the edge of the champagne region and visited Epernay, which after Rheims is the capital of the champagne trade. As usual, we ate very well. 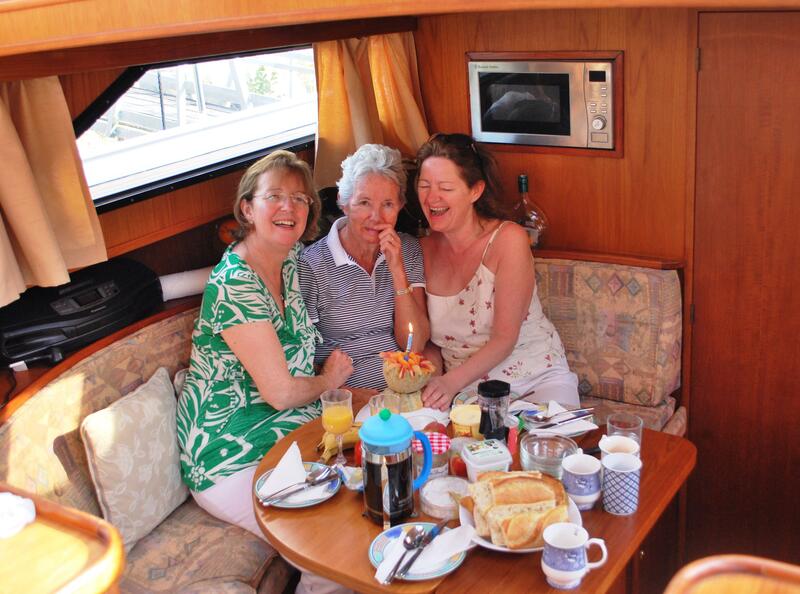 Aine and Kate quickly got into the swing of fresh baguettes and coffee for breakfast, lunch on the deck and dinner when it suited us. 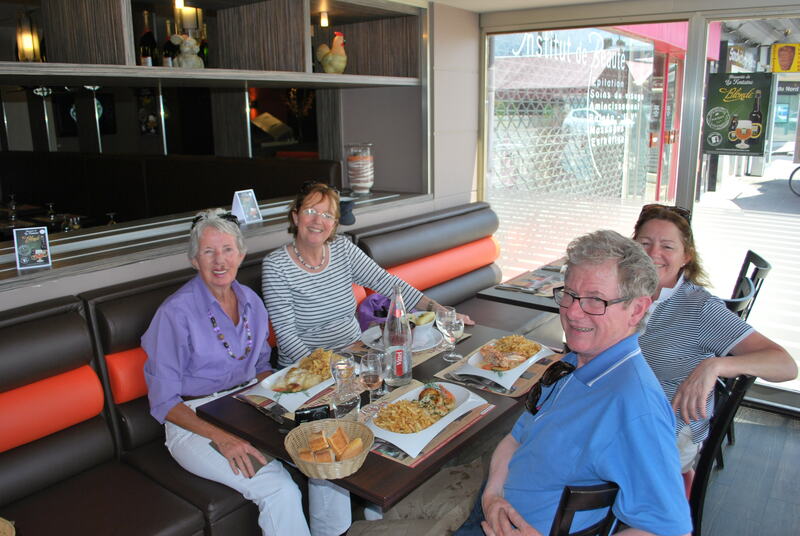 Aine treated us to lunch for Nuala’s birthday which we had in a traditional French restaurant in Chateau Thierry. 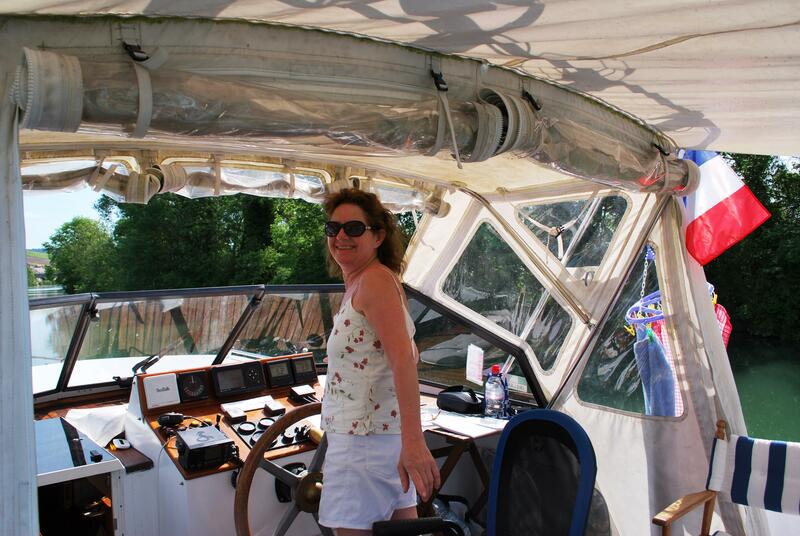 Kate steered the boat and brought it in and out of locks. Aine said that steering the boat was enough for her. Kate also took a great interest in our Strida bike and went to the shops in the morning, with me, to get the fresh bread. Aine found time to sew us a new Irish flag and stitch our ripped Bimini cover. A million thanks! They were sorry to have to leave us in Epernay and go by train to La Ferte to collect their hired car for the return flight to Dublin. We continued on our trip along the Canal of the Marne and Rhin on the way to Strasbourg. Unfortunately the good weather left with Kate & Aine! With all the good food, pleasant weather we could take this lifestyle for granted and maybe that is why we have not done many blogs on it. We will have to watch the waist lines now! Welcome to the good life! This entry was posted in Experiences on the Canals, On the Journey, Places visited, Visitors to C est la Vie and tagged canal locks, champagne, chateau thierry, epernay, La Ferte, Marne River, Meaux, Rheims. Bookmark the permalink. Hi my lovely Swans! Lovely blog and photos!! It’s hard to describe how magical a trip it was….what a great way to live. Just meandering along the rivers without a care in the world. You both looked 10 years younger and were so relaxed. I can understand now how the time just passes as the days all roll into one. Thanks for the wonderful trip and fab company. I will be back with u guys very soon and i just can’t wait! P.S good news on the weather front…its set to be sunny sky’s all the way for the near future. Enjoy and thanks again from a very jealous Kate!! Hi Kate — missing you both, so quite now. but i have found a great radio station.. plays old french and some english songs. its great. we never got the time to listen to French Music!..but you know how fast the time flies. Hi Jenny – thanks for birthday wishes and all the updates.. will email you in few days. i have my Jenny Bird with me… will send you a photo of it too..
hey you two don’t be having too good a time or you won’t want to come home ..
thanks for information I will follow up on it. where did I meet you?